Read the first chapters of REVENGE of the Stomping Demons. Grannie Hannah loved her little one room apartment in Greenwich Village. She knew it was perfect from the minute that she first saw it back in 1969. She was starting graduate school at NYU. It was the perfect place to live. The staff was great. There was a sense of community within the building. Her next door neighbor, a woman with children, took her under her wing. By the time she found out that the woman was an ex-wife of Norman Mailer it was too late to be intimidated by her. She liked her too much. When the building became a cooperative fifteen years later, she had just enough money to buy it. The neighborhood was still a bit of a slum and the coop fad was just beginning in Manhattan, so the insider prices were very affordable. She was proud to be a home owner. Grannie Hannah was a bit of a mystic, even in her youth. She read tarot cards and led guided visualization meditations. Her friends began referring to her as a witch. She preferred the term Wise Woman, even though it implied age beyond her tender years. “I’ll grow into it”, she thought, and grow into it she did. Meanwhile she was turning the apartment into a sanctuary for herself and her friends. The apartment upstairs from her sacred space was occupied by senior citizens, two sisters and a brother, who were exempt from the cooperative’s eviction policy for non-buyers. For another fifteen years the noise was minimal — shuffling of slippers, the TV cranked up occasionally for the hard-of-hearing. Then the last of the seniors was gone and the apartment was sold to Columbia University graduate students! Life changed drastically. The graduate students remodeled on the cheap. Their contractors put a nail through a gas line that wasn’t discovered for another decade. Grannie Hannah was lucky that she wasn’t blown up. Those first resident owners also did something in the renovations, knocked something loose somewhere, that caused the floor to vibrate like a large bass drum — and once they moved in, the apartment was used as a 24/7 dorm room with people coming and going all day and night. The noise was sometimes intolerable. An artist friend who did construction for a living helped Grannie Hannah put acoustical tile on half the ceiling. It made a noticeable difference. If the noise got really out of control, she would buzz the doorman and ask him to let the upstairs neighbors know that they were disturbing her. Most of the time they responded by dialing the volume back enough to be tolerable. Still, it wasn’t an ideal situation. Fortunately, they sold after they got their degrees. There were ups and downs with the next two resident owners. At one point she contacted the building’s Board of Directors with a formal complaint. She hesitated, however, to make it a matter of record that her apartment had a serious, ongoing noise problem because it effectively rendered the apartment unsaleable. Life suddenly became an ongoing dance between enjoying her home and maintaining the equity of her investment. The good life in Greenwich Village was over. She was just at the breaking point with the third owners when she received a notice that the apartment had been sold again. The newest buyers already owned the apartment next to the apartment upstairs from Grannie Hannah and were going to put the two apartments together. They said that they were planning substantial renovations, including sound-buffering enhancements. The shareholders had two children. Grannie Hannah was delighted. She liked the idea of having a family living overhead (SOOOOOOO naive!!!!!!) and she believed a complete renovation would alleviate whatever was causing noise to be magnified. For a few months, life seemed very good indeed. before the storm for resolution. After the previous owners moved out, the quiet upstairs was heaven-sent. Occasionally, the children of the new owners would run around the empty apartment with unbridled enthusiasm. Initially, it didn’t happen that often. If it went on for more than an hour or two, Grannie Hannah would ask the doorman to let them know that they were disturbing their downstairs neighbor (stomping in an empty room does make quite a racket). With the previous series of owners, she had approached them directly about the noise, asking for their consideration. It had never yielded satisfactory results. This time, she had decided to rely on an intermediary. (She was also making it a matter of record that there was a problem.) The first few times she applied her new strategy, the noise stopped shortly afterwards. “What nice neighbors they are!” she thought. Then they began the renovations and moved the family of four into the 650 square-foot space above her. The noise of demolition started shortly after 8:00 am most mornings. (The building regulations said that they weren’t supposed to make noise before 9:00 am or after 4:00 pm — clearly a regulation that these new owners thought they could ignore.) When the workers stopped for lunch, the nanny would bring the children into the apartment and let them run around, stomping on the floor for most of the hour until the construction noise started again. When the workers stopped making noise at 4:30 or 5:00 pm, the children would be back and all hell would break loose. They ran nonstop, slammed things onto the floor, dragged furniture back and forth across the bare floor, and jumped full force off of the furniture landing with a sound that made Grannie Hannah’s apartment shake. It was a temporary situation. She tried not to complain. It was a Friday afternoon, when it all finally came to a crisis point. 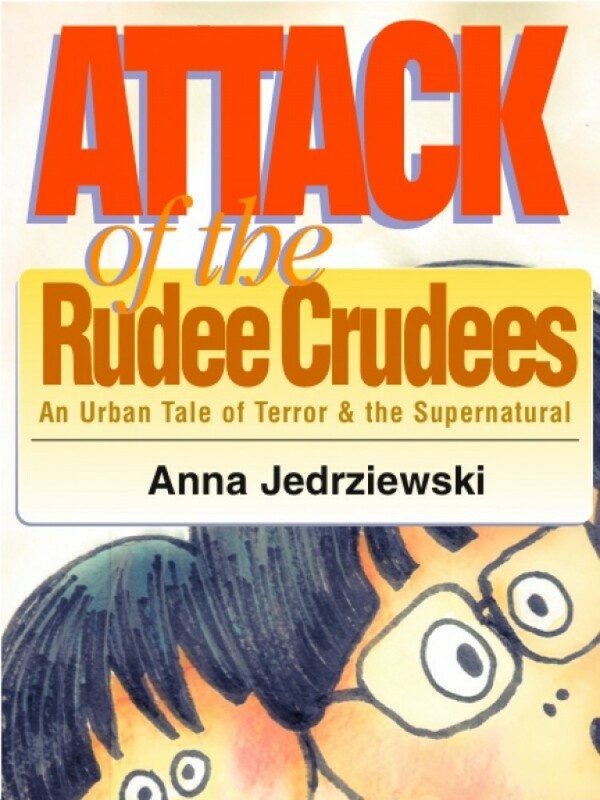 The Crudee children had run around the apartment for four hours, stopped for forty minutes, and then started again. Grannie Hannah had put up with five hours of outrageous noise when she finally asked the doorman to let them know that they were disturbing her. Grannie Hannah saw her life flash before her eyes — and with good reason. The noise was never-ending after that. Children stomping and slamming things on the floor early in the morning, then construction workers jack-hammering and drilling into the walls all day, then more stomping, slamming, dragging furniture around until 9:00 or 10:00 pm. Then, finally, there was the sound of the parents dragging the furniture back across the apartment and slamming things onto the floor as they cleaned up the mess. Grannie Hannah’s life had become a nightmare and her cherished little apartment had become a torture chamber. The sweet little children whom she had envisioned living upstairs had turned out to be pathological. She reminded herself that the degree of angry energy they were expressing indicated that they were very unhappy, possibly abused. By the end of the second month, however, she had started referring to them as terrorists. Even Wise Women have to deal with the real world. Human nervous systems can only take so much. 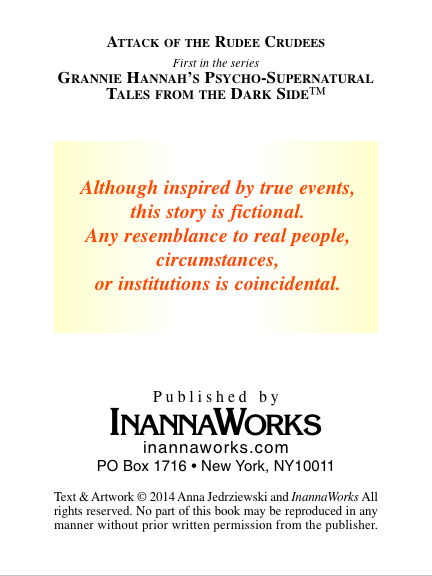 Read the whole horrific #occult story for $.99!